LockerGoga ransomware is cryptovirus that loads the malicious file on the system from the infected email attachment. A full system scan is required when you need to find the payload and terminate this cyber threat completely. Reimage also helps with virus damage removal. 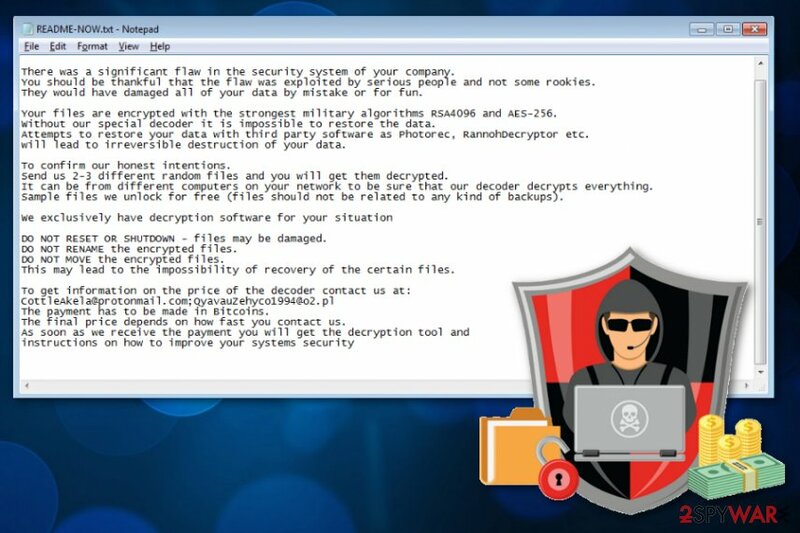 LockerGoga ransomware is the virus that marks encrypted data using .locked file extension. LockerGoga ransomware is a file locking virus that was initially discovered after attacks were launched against European companies, such as Altran Technologies in France. Most recently, malware attacked high-profile Norwegian aluminum manufacturer Norsk Hydro, stopping some production lines, crippling its IT systems across most business areas, and forcing the company to switch to manual operations instead. LockerGoga ransomware works very similarly to any other crypto-viruses: locks up files using AES-256 + RSA-1024 encryption algorithms, appends a file extension (in this case – .locked) and drops a ransom-demanding message README-NOW.txt. 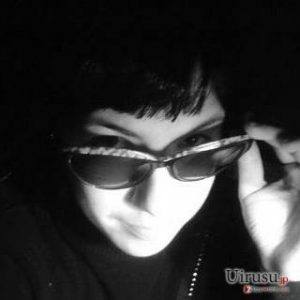 To free the data held hostage, victims have to email hackers via CottleAkela@protonmail.com, QyavauZehyco1994@o2.pl, DharmaParrack@protonmail.com, wyattpettigrew8922555@mail.com, or other, and find out what amount of Bitcoin is required for the alleged decryptor. The price usually varies, depending on how fast the company contacts cybercriminals. The malware also does a good job at evading detection, as the initial file is digitally signed (nevertheless, the certificates are now revoked). The malware was found changing victims' passwords and locking them out of the system. LockerGoga virus has similarities with such viruses like Everbe, GusCrypter, and Vurten. 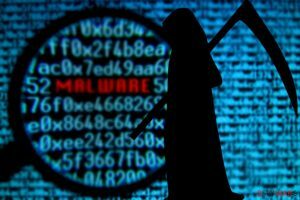 The first instance of this Goga ransomware virus was discovered involved the malware attack on an engineering consultancy firm that released an official press release to protect their users' data. The company also shut down their network and applications because operations were already affected in some European countries due to this attack. On the 24th of January 2019, Altran was the target of a cyber attack affecting operations in some European countries. To protect our clients, employees and partners, we immediately shut down our IT network and all applications. The security of our clients and of data is and will always be our top priority. We have mobilized leading global third-party technical experts and forensics, and the investigation we have conducted with them has not identified any stolen data nor instances of a propagation of the incident to our clients. Our recovery plan is unfolding as expected and our technical teams are fully mobilized. Throughout the process, Altran has been in contact with its clients, relevant governmental authorities and regulators. LockerGoga ransomware is a cryptovirus that mostly targets on companies, according to the ransom note. Since LockerGoga ransomware virus is a cryptovirus, the main purpose is to encrypt files on the targeted system and then demand ransom for the alleged decryption. From the sample that has been analyzed “worker” and “worker32” are the processes this ransomware launches on the infected device. The initial payload, however, often comes with files that are digitally signed by Alisa Ltd., Kitty’s Ltd., or Mikl Limited. This technique can help LockerGoga virus to evade detection. Fortunately, the digital signatures have since then been invalidated. Before engaging in any type of activities, LockerGoga ransomware makes sure that the attacked device is not a sandbox or a virtual machine. It was also spotted evading machine-learning kind of AV engines and sleeping over 100 times in some cases. When the payload is launched LockerGoga ransomware starts with its encryption and uses army-grade encryption algorithms RSA-1024 and AES-256. Because the virus authors target large-scale organizations, the locked files are mainly document extensions, such as .doc, .pdf, .ppt, .xlm, .xlsx, .js, .pptx, .,db, etc. (31 document extensions in total). According to research, the encryption process only takes a couple of minutes, as LockerGoga utilizes every CPU core to run the process as fast as possible. There was a significant flaw in the security system of your company. You should be thankful that the flaw was exploited by serious people and not some rookies. They would have damaged all of your data by mistake or for fun. Your files are encrypted with the strongest military algorithms RSA4096 and AES-256. Without our special decoder it is impossible to restore the data. Attempts to restore your data with third party software as Photorec, RannohDecryptor etc. will lead to irreversible destruction of your data. To confirm our honest intentions. Send us 2-3 different random files and you will get them decrypted. It can be from different computers on your network to be sure that our decoder decrypts everything. Sample files we unlock for free (files should not be related to any kind of backups). LockerGoga ransomware developers encourage victims to contact them via CottleAkela@protonmail.com and QyavauZehyco1994@o2.pl, but you shouldn't do that since it may lead to permanent data and money loss. As many researchers advise, you need to terminate this virus and then focus on data recovery. It is known that LockerGoga brings some malicious files together with it. Cybersecurity experts have discovered that the data is named hvwfcsky1377.bin – Kopya.exe, b3d3da12ca3b9efd042953caa6c3b8cd. 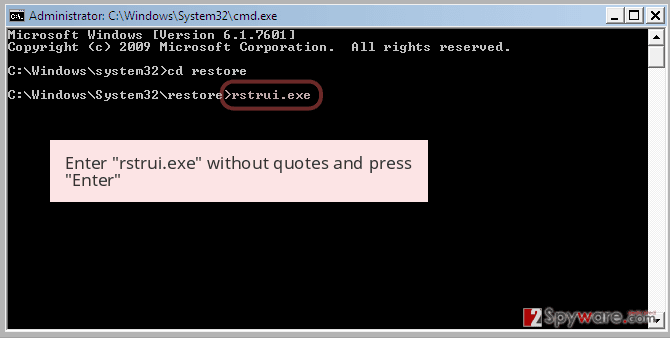 Additionally, some computer security programs such as AVG and Avast detect the virus as Win32:Trojan-gen. They all ran Microsoft Windows. Files, including some system files, had been encrypted. 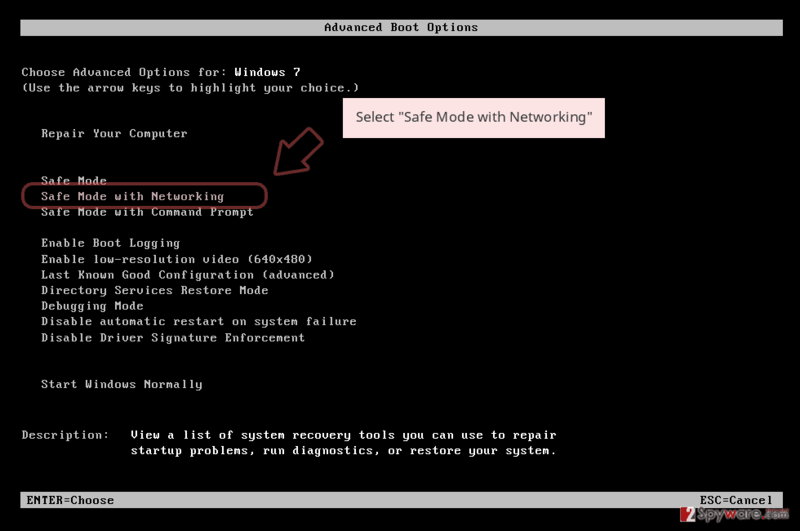 The network interface on every system had been disabled. The local user accounts on every system had their password changed. Nevertheless, this sample comes from the renowned Norsk Hyrdo attack, so the infection type might vary. However, when it comes to LockerGoga ransomware removal from the network of a company, you need to employ experts, IT specialists and take the internet security seriously. Professional cyber security experts can determine the damage and possible fix issues with affected data. If you as an everyday user need similar help with your encrypted files, check our software suggestions below the article. You need to remove LockerGoga ransomware using anti-malware tools like Malwarebytes Malwarebytes because this threat installs more files on the system and affects other parts of the device. 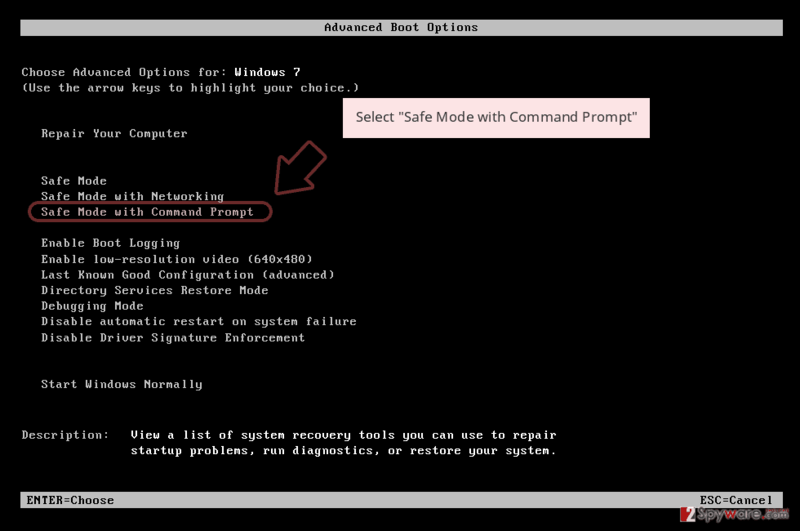 You may also benefit from virus damage removal using Reimage or similar PC repair tools. Located in Oslo, Norway, Norsk Hydro is the largest aluminum producer in the world, manufacturing almost half a million tons of the material a year. The company is also known for its activity in other sectors like solar power technologies, hydropower, and oil industry. The recent victim of LockerGoga - one of the biggest aluminum producer in the world Norsk Hydro in Norway. It is mostly direct labor: some of the activities that we use computers to do, today we use manual labor. We have to add some more people. According to him, the company is able to provide all the services and process all customer orders as usual, although it is not clear whether the future procedures will be affected, as the official website is down currently. Norsk Hydro is now focusing on continuing regular operations via manual methods, minimizing the financial and operational losses, and recovering the IT systems using backups. Due to LockerGoga ransomware attack, the aluminum prices went up to record-high in the past three months, and the company's stock price went down by 3.4%, which later went back up by 0.8%. Later in March, MalwareHunterTeam discovered a new sample of LockerGoga which was also uploaded from Norway, so security team believes that it was used in the Norsk Hydro attack. This variant of the virus uses new contact details – DharmaParrack@protonmail.com and wyattpettigrew8922555@mail.com. The company published a press release announcement that explains the situation further. 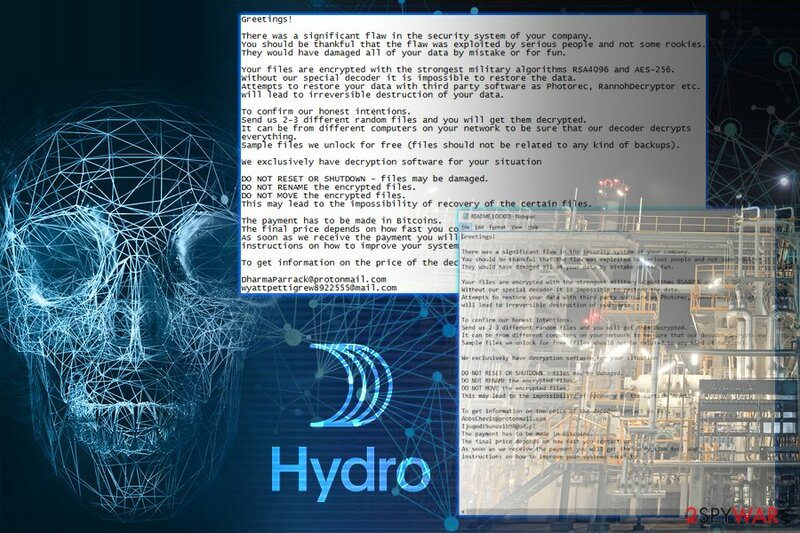 According to Norsk Hydro, it is recovering from the attack with the help of external parties, such as Microsoft, and are not planning on paying ransom to LockerGoga authors. Instead, the company is focusing on recovering all the crucial data from backups. Most of the company's procedures are running as usual, although some employees are still forced to perform some manual operations. By far the biggest downfall of the attack was that the company could not access a full list of customer orders, as stated in the press conference release by Chief Financial Officer Eivind Kallevik on Thursday. Hydro still does not have the full overview of the timeline towards normal operations, and it is still too early to estimate the exact operational and financial impact. Despite that, based on the samples published on Virus Total and insight from multiple security researchers, it is clear that hackers managed to break-in to the company's networks and then gained access to Active Directory server. From there, the attackers spread LockerGoga ransomware laterally, as the virus does not have the capability of propagating itself on the network. After encrypting files, LockerGoga disabled hardware (network cards) from working and also changed passwords of every account, preventing anybody from accessing their workstations. 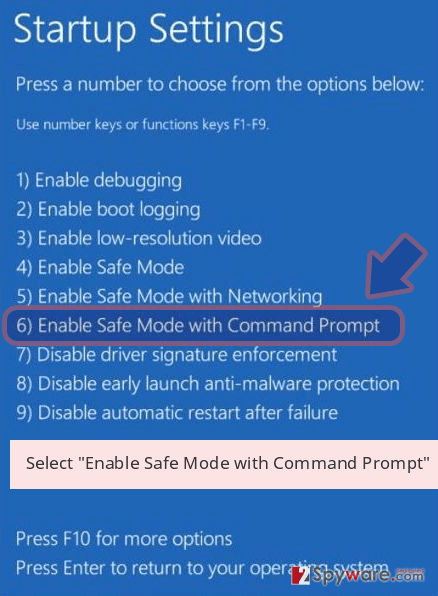 This scheme is performed in order to slow down the recovery operations, as each PC needs to be taken care of separately, instead of uploading backups from a cloud service. According to research from Cisco Talos team, LockerGoga is much closer to a destructive type of malware – wiper, rather than ransomware. Nevertheless, it is just a theory, and the real goals of hackers are only known by them. 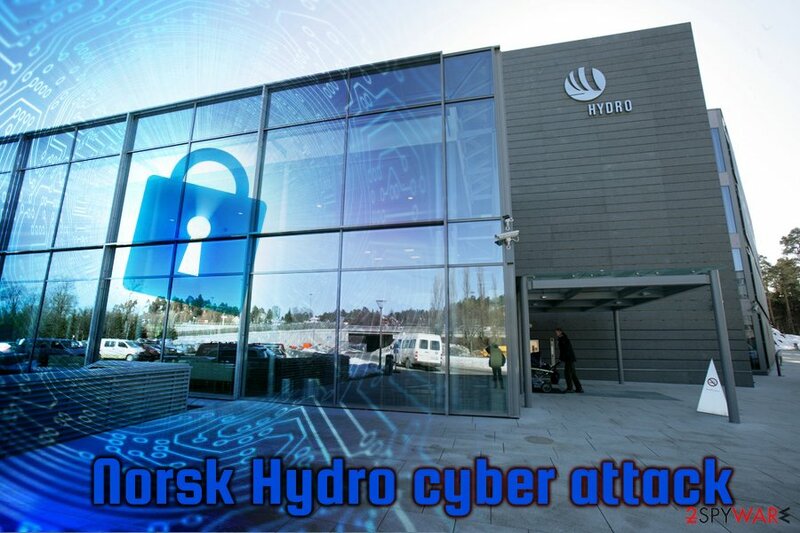 Norsk Hydro said that it is recovering from the LockerGoga ransomware attack with the help of such companies like Microsoft. Nevertheless, it is still too early to estimate financial impact. Spam email campaigns grow to a new level when emails may even go to your regular email box directly and look legitimate and safe because malicious actors use names like DHL, FedEx, Amazon or PayPal to make the impression of legitimacy. When you receive an email, you were not expecting to get make sure to pay more attention to details. Often subject lines like Invoice or Order information tell about the questionable content of the email, especially when the name of a service is not familiar. You should delete suspicious emails and avoid opening files attached because documents or PDF files can contain malicious macros or even direct payload. This is the main distribution technique when it comes to crypto malware like miners or ransomware. We can understand that LockerGoga ransomware virus is a severe threat and file encryption is the primary concern of yours. However, we cannot stress enough how important it is to terminate all related processes and clean the device entirely before focusing on anything else. Remove LockerGoga ransomware using anti-malware tools like Reimage, Malwarebytes MalwarebytesCombo Cleaner or Plumbytes Anti-MalwareMalwarebytes Malwarebytes and scan the device fully so that all virus damage can be fixed. You can use a few tools and scan the system a few times to double-check because ransomware is a persistent cyber threat. When the LockerGoga ransomware removal is done, you can proceed with data recovery options. The best solution for this should be data backups on the external device. However, not everyone has up-to-date backups. For this reason, we have a few suggestions of software and features on your computer that may help in file recovery. Log in to your infected account and start the browser. Download Reimage or other legitimate anti-spyware program. Update it before a full system scan and remove malicious files that belong to your ransomware and complete LockerGoga removal. 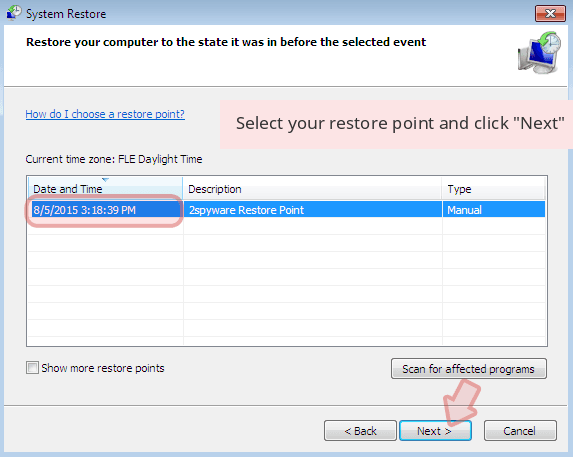 When a new window shows up, click Next and select your restore point that is prior the infiltration of LockerGoga. After doing that, click Next. 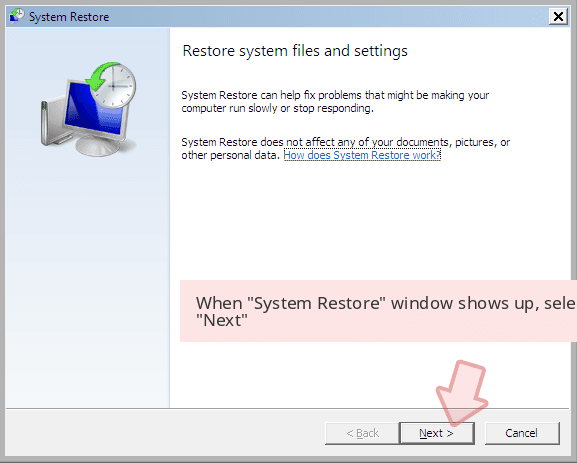 Once you restore your system to a previous date, download and scan your computer with Reimage and make sure that LockerGoga removal is performed successfully. 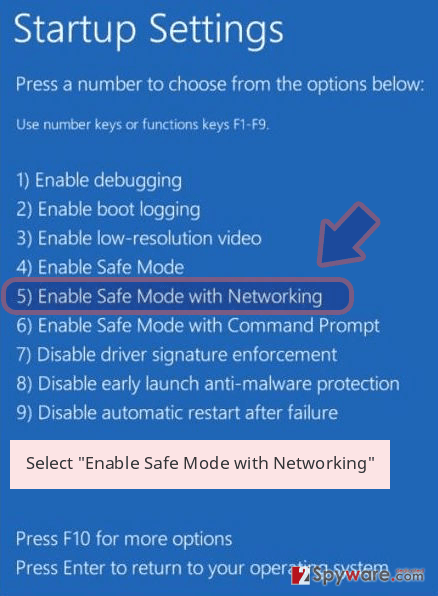 Guide which is presented above is supposed to help you remove LockerGoga from your computer. To recover your encrypted files, we recommend using a detailed guide prepared by 2-spyware.com security experts. ^ France's Altran Tech hit by cyber attack. Reuters. Business & Financial news, US & International breaking news. ^ Norsk Hydro: Hydro subject to cyber-attack. Oslo Bors. Oslo Stock Exchange. ^ Stéphanie Bia. Information on a cyber attack. Globenewswire. Resource of press releases. ^ Sandbox. Techopedia. Where Information Technology and Business Meet. ^ What You Need to Know About the LockerGoga Ransomware. Trend Micro. Security blog. ^ Kevin Beaumont. How Lockergoga took down Hydro — ransomware used in targeted attacks aimed at big business. Doublepulsar. Cybersecurity from the trenches of reality, written by Kevin Beaumont. ^ Update on cyber attacks March 21. Hydro. Official press release announcement. ^ Cyber attack on Hydro update and status as of march 20. Webtv. Streaming television. ^ Ransomware or Wiper? LockerGoga Straddles the Line. Talos Intelligence. Security research group. This entry was posted on 2019-04-03 at 08:48 and is filed under Ransomware, Viruses. You can quickly scan the QR code with your mobile device and have LockerGoga ransomware manual removal instructions right in your pocket. How did you remove LockerGoga virus?